[…] looking at the Windows Server Security Bulletins over the past two years, 40% of them would not have applied to a theoretical Server Core build. The results of the analysis are encouraging in terms of security progress. 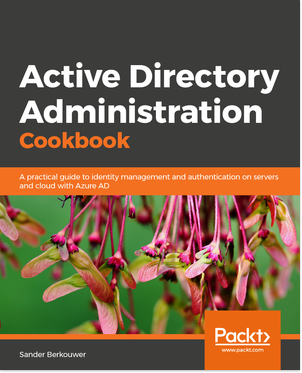 In this post I’ll look at the updates required for various flavors and derivates of Windows Server 2008 and the implications in terms of (planned) downtime between these flavors. This blogpost is not intented to fully research the difference in the total amount of updates between a Server Core installation and a Full installation of Windows Server 2008. It merely provides a comparison based on a random moment in time as reference material. It does not take refreshed updates into account. The only setting I changed during installation was the keyboard lay-out which I set to US-International. On the full installations I used Windows Update to determine the required updates. On the Server Core installations I used cscript.exe WUA_SearchDownloadInstall.vbs to determine the updates. On Hyper-V Server 2008 I used HVConfig.cmd wizard. I installed and checked for updates on Wednesday October 22, 2008. I saw there were no differences between updating a Windows Server 2008 edition with or without Hyper-V (same updates apply) and no differences between updating an Enterprise and a Standard edition (same updates apply). Full installations of Windows Server 2008 required 22 updates and 1 optional update. Server Core installations of Windows Server 2008 required 19 updates. After installation Hyper-V Server 2008 required 15 updates. At first glance these numbers don’t seem to represent Microsoft’s promise of 40% less updates. You can see clearly both Server Core and Full installations of Windows Server 2008 get the same performance, compatibility and stability updates. Since Hyper-V Server doesn’t contain the ‘usual’ Server roles, these apparently didn’t need to be patched. Server Core installations and Full installations of Windows Server 2008 required 8 updates. Hyper-V Server 2008 required a mere 4 updates. 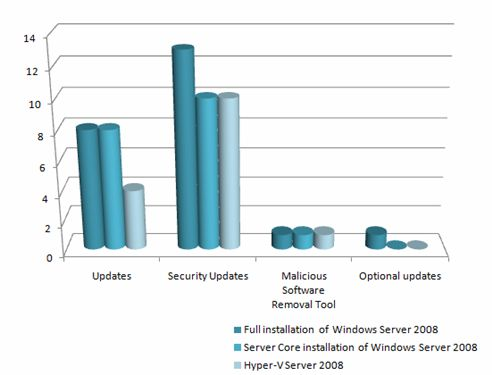 Server Core installations and Hyper-V Server 2008 installations however are less vulnerable to unknown attacks, compared to Full installations of Windows Server 2008. Hyper-V Server is Finally Here – But What Exactly Is It? Server Core Install vs. Full Install – Let’s Get Ready to Rumble! Normally you patch your servers once a month, after the updates come out monthly. Can i conclude that although server core has less patches, you still have to reserve managed downtime to apply patches that server core also needs? So actually the number of patches isn’t that important, but more the fact if you need to reboot your server core machine after applying a patch. For example: MS will issue 2 security updates next month, only one of those 2 will apply to server core. But you still have to update server core as well because it needs the other update. Downtime for Full and Core will be the same at that point. On the other hand, if only 1 security update is released for WS2008 and it only applies to the Full version, you don’t have to plan downtime for your Core server. I’m very curious to see how the patching of server core will look like in a year or so. Time will tell. Are you sure that KB947864 is applied to Core and Hyper-V server only? I would say that this one only applies to Full since that’s the only edition having IE7 installed. The Cumulative update for Internet Explorer 7 (KB974864) corresponding with MS08-24 applies to Server Core installations and Hyper-V Server 2008 installations only. For Full installations this update has been replaced with a newer version (KB956390), corresponding with MS08-50. This later update does not (yet?) apply to Server Core installations. I counted everything described as a Security Update as a Security Update, as well as updates related to a security bulletin or security advisory. I’ve therefor placed the cumulative updates for Internet Explorer 7 and the cumulative update for Active X Killbits in the Security Updates category.